We all have things, be they rituals or physical things or some sort of mantra, that keeps us grounded during the day. Let’s face it, being a human being can be real hard. I’m not here to tell you that life isn’t filled with joy and love and moments that make you believe in something beyond yourself in some sense, but it’d be vain to ignore all the anxieties, worries, and devastation that comes along with being this strange bundle of cells. Every one of us finds something to latch on to that gives us a sense of order in all the chaos. Without that, it can feel like we’re flailing. We crave that feeling of being in control of our own fate. Losing that feeling of being grounded is the catalyst for much of the action in “Catch Of The Day.” There’s Phil, whose daily ritual involves kicking his underwear into the air and catching it in the moments before he takes a shower. On this day, he fails to catch it, and past experience tells him he’s about to have an awful day. For Haley, her sudden change is more modern. When she’s forced to sleep outside as punishment for losing her keys, she breaks her phone after throwing it at some apparently aggressive squirrels. That forces her to go days without her phone. Cam and Mitchell aren’t in exactly the same boat, but there’s a certain foundation to their being that’s shaken during their kitchen renovations, as Mitchell fears that he’s not as assertive as he thinks. None of these storylines is particularly inventive, and as the episode rolls on they go increasingly off the rails. With that said, many of the smaller moments hot the mark, and it’s enough to make “Catch Of The Day” fitfully rewarding. For my money, the best storyline in the episode is Haley’s. While is does rely a little too much on Haley being dumb and vapid—it’d be nice to see that character grow a little—there’s something wonderfully earnest in her not only learning to survive without her phone, but also starting to notice the little things that bring us pleasure in life. Haley’s technology-less transformation starts out small, as she literally stops to smell some flowers on the golf course. Before long though she’s looking for quiet moments in order to just be with herself, reading To Kill A Mockingbird, and musing on the way the bees buzzing around her seem to be talking to one another. She even notices how lucky she is to have Phil and Claire for parents. She underlines just how funny her dad is before admiring that her mom is the CEO of a company. For a short time Haley learns some valuable lessons and gains a new perspective on her life. It’s wishful thinking to assume she’d genuinely learn from those lessons, as her new phone brings about a quick regression, but for at least one episode we get a sunnier, more present Haley, and that’s, well, nice. I can’t say that Phil and Claire’s escapades are as delightful. There’s certainly enough physical and visual comedy to warrant a few laughs—Phil’s chair breaking moments after getting a paper cut is a nice touch—but there’s just not much else to latch on to. I will say, however, that the story’s climax is a nice change of pace. Watching as Claire moves from chastising Phil for his stupid, superstitious ritual to then being unable to deny the pile of evidence that suggests something weird is going on, is a good subversion of the “Phil is sweet but also kind of incompetent as a husband” story that the show often rolls with. 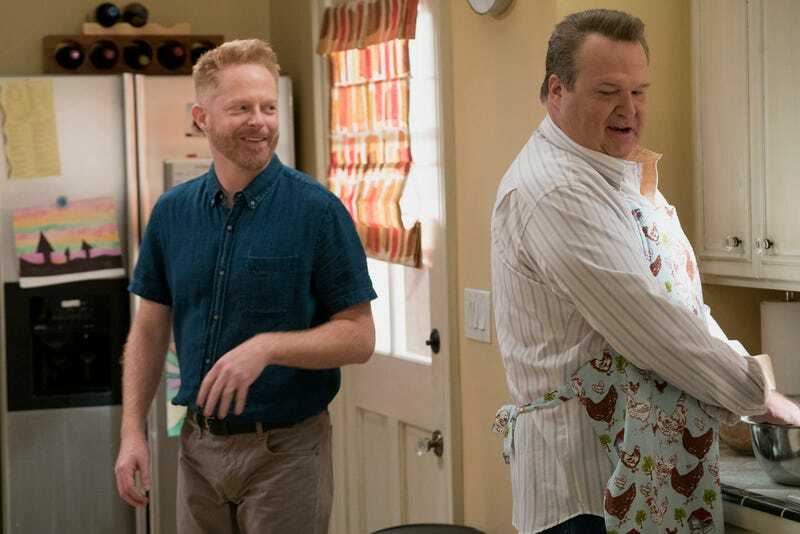 When it comes to Cam and Mitchell renovating their kitchen I’m fascinated with the idea that Modern Family is perhaps exploring some of the tension in their relationship. Pam remains a weekly annoyance, but when you put that to the side, the show seems to be dropping hints that Cam and Mitchell are having some problems. That’s always been the case with those two, but it feels more explicit so far this season. If the kitchen renovation continues to be a plot point for a few more episodes, there’s a good chance that we haven’t seen the last of their squabbles. But this is more than squabbling, isn’t it? There are issues of trust here that feel subtle but very real. Rather than be secure in who he is and Cam’s love for him, Mitchell can’t help doubting his partner. He goes so far as to willingly get entombed behind the drywall in the kitchen in order to avoid admitting to Cam that he was eavesdropping. When he addresses that moment to the camera, he admits that marriage counselling might have to be back on the table. Mitchell tosses that comment out there and then quickly moves on, but I can’t help thinking there’s more going on here. In the season premiere the two seemed incredibly annoyed with each other. Then Mitchell lied to Cam, refusing to take the blame for the fire that destroyed their kitchen despite knowing it was his fault, however accidental it might have been. Now he’s eavesdropping on his husband, paranoid and assuming that Cam is constantly undermining his authority. This is what happens when we feel lost, when we feel like we’re on shaky, unfamiliar ground for one reason or another. Phil and Haley each find their way back to their particular center. Mitchell, on the other hand, still seems lost. If Modern Family can lean into that, we could be in for some truly challenging storytelling this season. Let’s keep our fingers crossed. There’s not much to talk about with Jay’s storyline this week, but this was maybe the first time I’ve enjoyed Joe. His sneaky, “check her phone, check her phone” moment was cute and hilarious. Now we know that Pam is the three-time winner of her county’s annual mule drag.